Gladiator biplanes were used operationally by 3 Squadron RAAF in the dramatic period of of advances against the Italians between November 1940 and February 1941. A fantastic online source of information about 3 Squadron's operations is Håkan's Biplane Fighter Ace website. - It's a delightful site, specialising in the unusual topic of biplane combat early in WW2. Packed with detail, Squadron's Gladiator boys get many mentions and their individual missions are given exhaustive coverage. For example, see the Alan Boyd page. There is also a data page about the Gladiator aircraft itself. Gladiators were the last of the biplane fighters. They were the descendants of the Pups, Camels and S.E.5As used by the R.F.C., the R.N.A.S., [and the Australian Flying Corps] in World War I. Their own particular family tree was a complex and distinguished one. The Gloster Gladiator was one of the most successful and illustrious names in a long line of machines designed by Mr H. P. Folland. Its immediate ancestor was the Gauntlet, and its prototypes the SS19b, the SS19, the SS18b, and the SS18, a line of development which arose from Air Ministry Specification F20/27. In 1934 the G.37 was produced by the Gloster Company to meet the requirements of Specification F7/30. This was the prototype Gladiator, No. K5200. The prototype machine lacked some of the more modern refinements which were to be incorporated in the production model. It had the old Gauntlet type cowling and 'spatted' tail wheel and did not have the cockpit hood fitted to later machines. But it did possess some modern and outstanding features. The undercarriage was of a new type. It employed Dowty internally sprung streamlined wheels, and the old cumbersome 'birdcage' of struts and bracing wires had been done away with in favour of two graceful, knife-like single legs inside which the six-inch travel of the Dowty gear absorbed all shocks. The first delivery of Gladiators was made to the R.A.F. in 1937 under the new 'Expansion Scheme'. The first squadrons to have them were Nos. 3(RAF), 56, and 72. They soon found that Glosters had given them a winner. The little single-bay biplane was robust and highly manoeuvrable, so that it was exceptionally good for aerobatics. The aircraft seemed to have no faults. Soon, more squadrons received the new machines: Nos. 17, 33, 54, 65, 73, 80, 87, 223, 247, 602 (City of Glasgow Squadron), 603 (City of Edinburgh Squadron), 607 (County of Durham Squadron) and 615 (County of Surrey Squadron). The Gladiator continued to show herself a star performer in the aerobatic line. In 1938 at the R.A.F. Air Show three of them flew chained together in V formation. In 1939 the naval version of the Gladiator, called the Sea-Gladiator, was introduced into the Fleet Air Arm. This version of the machine incorporated various special naval fittings, including a deck-arrester hook, a dinghy and several internal modifications. Painting of the RAF's famous Faith, Hope and Charity. The three lonely Gladiators that defended Malta in the early days of the war against the Italians. The Gloster Gladiator was basically of all-metal construction, of steel tube and strip. The fuselage was of the Warren-girder type, with steel tubes and internal wire bracing. The wings were based upon two spars made of steel strip with steel compression ribs and dural lattice ribs. The whole aircraft was fabric-covered. The internal structure made for great strength and durability. Little did the men who planned and built the aircraft know what a severe test this same structure would one day be put to. Armament consisted of four .303 machine guns, two of them in the fuselage, firing forward between the propeller blades by means of an interrupter gear, and two in 'blisters' under the wings. The aircraft had a maximum speed of 250 m.p.h. at 15,500 feet, could climb to 15,000 feet in 5.8 minutes and reached its ceiling at 32,800 feet. It cruised at 210 m.p.h. and landed at 59 m.p.h. A main tank and a gravity tank had a fuel capacity of 64 gallons and 20 gallons respectively. The Gladiator was the last biplane to be constructed by the Gloster Company and the last biplane to be operationally employed by the R.A.F. and the R.A.A.F. A total of five hundred and twenty-seven Gladiators were built altogether and, of these, a total of two hundred and sixteen were supplied to the governments of Belgium, China, Greece, Finland, Iraq, the Irish Free State, Latvia, Lithuania, Portugal, Norway and Sweden. 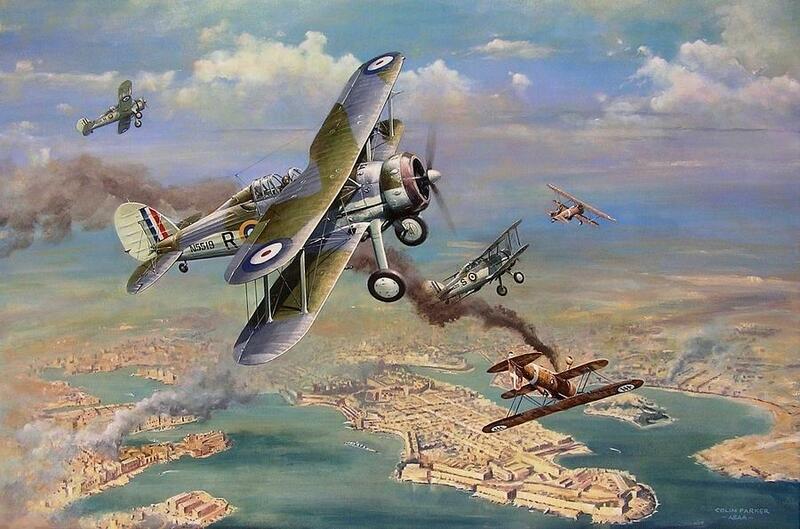 By the time war came, the Gladiator was on its way out, and most frontline squadrons of the R.A.F. had been re-equipped with Hurricanes. The Gladiator, with its mixture of ancient and modern features, was something of a transition type. But it was not a mongrel. What it lacked in speed and armament it made up for a great deal in manoeuverability, reliability and sheer airworthiness. It was in fact a pedigree machine, the final flower of the old, sturdy, dog-fighting biplane fighters. As such it was destined to uphold with great honour the name of the old Air Force. The Gladiator, so aptly named, was to carry the reputation the old Royal Flying Corps gained against the German Air Force in World War I into a second Great War, a war in which speeds had trebled, and give it greater glory. From the very beginning of the war the Gladiators were in the thick of the fight. Nos. 607 and 617 Squadrons took their Gladiators to France, where they distinguished themselves. A Gladiator from 603 Squadron scored one of the first air victories of the war by shooting down a Heinkel III into the Firth of Forth. This was the aircraft that the Air Force hoped to use to defend Malta and the Middle East in the event of an attack by the Regia Aeronautica - a tough, intensively airworthy little aeroplane, but sadly out-dated by the modern machines of the Italians.